Two weeks ago, the buzz in the airline industry was the launch of a private branded airplane by the Toronto-based luxury hotel chain Four Seasons. 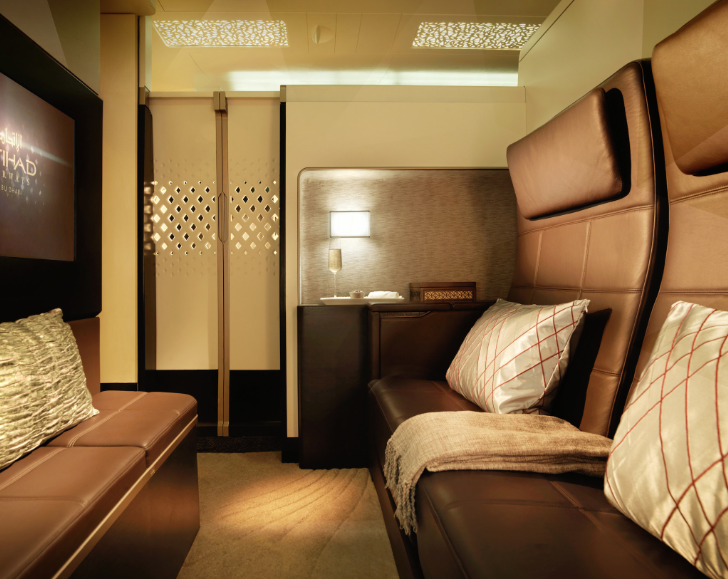 Today, it’s Etihad Airways announcing the launch of hotel-style rooms on its aircraft to lure wealthy passengers. The UAE carrier says The Residence on its Airbus A380 will be the world’s most luxurious living space in the air. “Accommodating single or double occupancy, it features a living room, separate double bedroom and en suite shower room. Guests in The Residence will also have a personal Butler” the airline said Sunday. For those who can’t afford The Residence, Etihad will offer private suites called First Apartments, which will have a separate reclining lounge seat and full-length bed, as well as a mini-bar, personal vanity unit and wardrobe. On its Boeing 787 Dreamliners, the attraction will be the so-called First Suite. Etihad says each First Suite will be fitted with a personal wardrobe, drinks cabinet and space that allows you to entertain another guest. 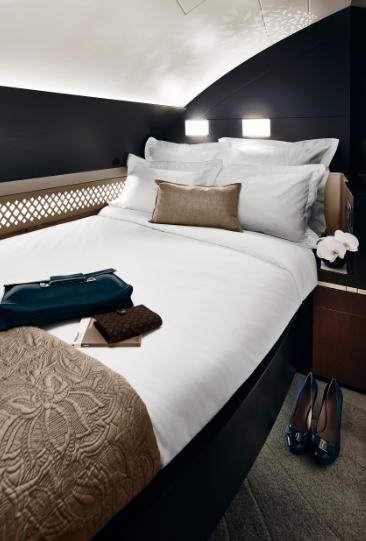 “These new living spaces will raise inflight product and service standards to their highest level yet in commercial aviation and alter air travellers’ expectations of inflight comfort and luxury forever,” said James Hogan, Etihad president and CEO. The interiors of the two aircraft were designed by the Etihad Design Consortium, established in 2008. The airline said EDC brought together three top design companies, Acumen, Factorydesign and Honour Branding, to develop cabin and seat designs for the new fleets. Etihad has ordered 71 Dreamliners, 41 787-9s and 30 787-10s. It also has ordered 10 A380s, with an option for another five superjumbos. The airline is expected to take delivery of the new aircraft, starting this fall. All images are courtesy of Etihad. An artist’s impression of Masdar City. Masdar City photo. Abu Dhabi, one of the world’s largest oil producers, is also a leader in environmental initiatives. 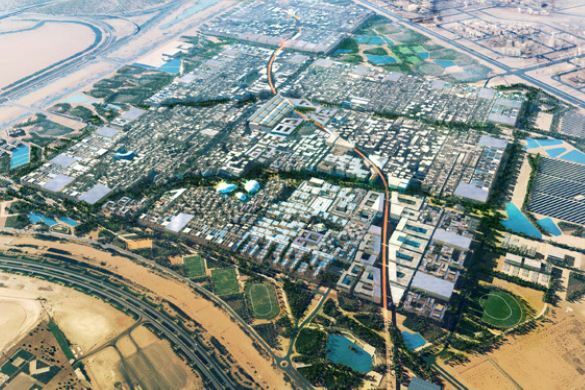 Its most ambitious project is the solar-powered Masdar City, which is being built about 20 kilometres east of the United Arab Emirates capital. One of the institutes behind the project, the Masdar Institute of Science and Technology, is now joining state-owned Etihad Airways, U.S. aircraft maker Boeing and French oil giant Total to produce aviation biofuel in the UAE. Oil refiner Takreer will also be a partner in BIOjet Abu Dhabi. “BIOjet Abu Dhabi will engage a broad range of stakeholders to develop a comprehensive framework for a UAE biofuel supply chain, including research and development and expanded investment in feedstock production and refining capability in the UAE and globally,” the companies said Sunday. A day earlier, an Etihad Boeing 777 took off on a 45-minute demonstration flight, powered in part by biofuel produced in Abu Dhabi. “Our goal is to support and help drive the commercialization of sustainable aviation fuel in Abu Dhabi, the region and also globally,” said James Hogan, president and CEO of Etihad. The BIOjet Abu Dhabi initiative comes just days after Boeing said it was awaiting regulatory approvals to use green diesel on its airplanes. “Boeing works with partners around the world to advance sustainable biofuel development and sees great opportunity for BIOjet Abu Dhabi to have a positive impact in the UAE and globally,” said Jeffrey Johnson, president, Boeing Middle East.